Introduction “Eutrophication” is the process of a waterbody’s becoming increasingly rich in aquatic plant life such as algae and aquatic macrophytes (water weeds). It is driven by the increasing input of aquatic plant nutrients, principally nitrogen and phosphorus, from natural and anthropogenic sources. While natural eutrophication takes place over geologic time, activities of people that increase the aquatic plant nutrient inputs to waterbodies can rapidly accelerate this process and cause cultural eutrophication. Thus the term “eutrophication” has become synonymous with “excessive fertilization” or the input of sufficient amounts of aquatic plant nutrients to cause the growth of excessive amounts of algae and/or aquatic macrophytes in a waterbody such that beneficial uses of the waterbody (i.e., water quality) are impaired. Beneficial uses of waterbodies that stand to be impaired by the presence of excessive amounts of aquatic plant life include domestic and industrial water supply, recreation, and fisheries. Because of the public health and environmental quality significance of these water quality impairments, myriad strategies have been advanced to evaluate and regulate excessive fertilization Invited contribution published as, Jones-Lee, A., and Lee, G. F., “Eutrophication (Excessive Fertilization),” Water Encyclopedia: Surface and Agricultural Water, Wiley, Hoboken, NJ pp 107-114(2005). and nutrient input to waterbodies, with varying degrees of technical validity and demonstrated effectiveness. This chapter reviews what should be considered in assessing the impacts of nutrients that are added to a waterbody on the waterbody’s eutrophication-related water quality. References are provided to more detailed discussions of the issues covered. Impacts of Excessive Fertilization on Water Quality The excessive fertilization of waterbodies is a long-standing, well-recognized water quality problem throughout the US and other countries. It is manifested as excessive growths of planktonic (suspended) algae, attached algae, and aquatic macrophytes (water weeds). Aquatic macrophytes can be floating forms such as water hyacinth or duckweed, or attached-emergent forms. Water quality problems caused by these growths, discussed in detail by Lee (1973), are summarized below. Domestic Water Supplies. When raw water supplies contain large amounts of algae and some other aquatic plants, the cost of treatment increases and the quality of the product may be diminished. Planktonic algae can shorten filter runs. They can also release organic compounds that cause tastes and odors, and, in some instances, serve as trihalomethane (THM) and haloacetic acid (HAA) precursors. THMs are chloroform and chloroform-like compounds; HAAs are low molecular weight chlorinated organic acids. These compounds are produced when the precursors react with chlorine during the disinfection process and are regulated as human carcinogens. Violations of Water Quality Standards. Excessively fertile waterbodies can exhibit marked diel (over a 24-hr day) changes in pH and dissolved oxygen concentrations that can result in repeated short-term violations of water quality standards. During daylight, algal photosynthesis removes CO2 from the water which increases the pH; algal respiration in the night releases CO2 and lowers the pH. In late afternoons the pH of excessively fertile water can be found to exceed the water quality standard for pH. Similarly, algae produce oxygen during photosynthesis, but consume it during respiration. Just before sunrise, after sufficient nighttime algal, bacterial and other organism respiration, dissolved oxygen concentrations can be below water quality standards for protection of fish and other aquatic life. Excessively fertile waterbodies that thermally stratify (develop a thermocline) often exhibit dissolved oxygen depletion below the thermocline due to bacterial respiration of dead algae. Richards (1965) showed that one phosphorus atom, when converted to an algal cell which subsequently dies, can consume 276 oxygen atoms as part of the decay process. Toxic Algae. One of the major stimuli for the US EPA’s recently increased attention to excessive fertilization is the Pfiesteria problem in Chesapeake Bay (US EPA, 2000a); fish kills occurred there due to the presence of toxic algae. Fish kills associated with toxic algae have occurred in various waterbodies around the world, including off the west coast of Florida, for many years. In addition, blue-green algae at times excrete toxins that are known to kill livestock and other animals that consume the water. Impaired Recreation & Aesthetics. Excessive growths of attached algae and aquatic macrophytes can impair swimming, boating and fishing by interfering with water contact. Severe odor problems can also be caused by decaying algae, water weeds, and algal scums. Shallow Water Habitat. Emergent aquatic vegetation in shallow waters provides important habitat for various forms of aquatic life. As discussed by Lee (1973), increased planktonic algal growth reduces light penetration (water clarity) which in turn inhibits the growth of emergent vegetation. This can result in loss of significant aquatic life habitat. Overall Impacts. Excessive fertilization is one of the most important causes of water quality impairment of waterbodies. In its last National Water Quality Inventory, the US EPA (2000a) listed nutrients as the leading cause of impairment of lakes and reservoirs. Controlling Excessive Fertilization Algae and other aquatic plants require a wide variety of chemical constituents, light, and appropriate temperatures to grow. Of those factors, however, only nutrient input is amenable to sufficient control to effect a meaningful decrease in algal and aquatic plant biomass to reduce the adverse impacts of excessive fertilization. The issues of which nutrient(s) should be controlled, sources of the nutrient, what type of and how much control is needed, and the positive impacts of the control must be addressed in an eutrophication management program. Limiting Nutrient. For managing algal populations, the primary focus should be on control of the nutrient that is present in the least amount compared to algal needs, i.e., the limiting nutrient. Increasing or reducing the amount of that nutrient available to algae will effect an increase or reduction in the algal biomass that can be sustained. This is illustrated in Figure 2 which shows that additional growth occurs in response to additional input of the limiting nutrient up to the point at which it is present in greater amounts than can be used. Nitrogen and phosphorus are the nutrients that typically limit algal growth. Phosphorus is more often the limiting nutrient in freshwater waterbodies, while nitrogen is often the limiting nutrient in marine waters. While the potassium content of some soils can limit the growth of terrestrial plants, potassium is not an element that limits aquatic plant growth. In order to determine which nutrient is limiting algal growth in a particular waterbody, some have relied on the comparison of the concentrations of nitrogen and phosphorus to the “Redfield” stoichiometric ratio of these elements in algae (16:1 atomic basis or 7.5:1 mass basis) shown in Equation 1. Dry Fallout 0.08 1.6 * Describe nitrogen loadings for waterbodies in Western US. an empirical, statistical model, such as the Vollenweider-OECD eutrophication model discussed subsequently herein, developed from a large database quantifying how nutrient concentrations or loads relate to the nutrient-related water quality characteristics of the waterbody, and deterministic models, in which differential equations are used to describe the primary rate processes that relate nutrient concentrations/loads to algal biomass. Deterministic models have a number of drawbacks for use in eutrophication management. Because of the number of equations incorporated into a deterministic model, there is no unique solution to the model. “Tuning” the model to match the nutrient loads and eutrophication condition in the waterbody of interest at the outset may not properly represent the conditions and response after nutrient load alteration. Thus its ability to reliably meet the goal of management evaluation – i.e., predicting the benefit to be gained by management options – is limited. If the water quality problem is related to planktonic algae, the Vollenweider-OECD Eutrophication modeling approach is the recommended approach for determining the reduction in nutrient loads/concentrations necessary to achieve the desired nutrient-related water quality in many lakes and reservoirs. 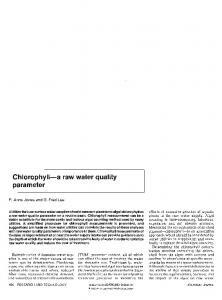 Described by Rast and Lee (1978) and amplified by Jones and Lee (1982, 1986), this model empirically relates normalized phosphorus loading to eutrophication-related water quality parameters of chlorophyll, water clarity, and hypolimnetic oxygen depletion rate through relationships formulated by Vollenweider (1976). These relationships take into account the influence of the key factors of the waterbody’s mean depth, hydraulic residence time, and surface area on the utilization of phosphorus by algae within a waterbody. These models, based on the OECD (1982) and post-OECD Eutrophication Study data, are shown in Figure 3. Each point in each figure represents a lake, reservoir or estuary for which the nutrient load and eutrophication response had been measured for at least a year to generate the model point. Jones and Lee (1986) updated this model with data for more than 750 waterbodies in various parts of the world (Figure 4). The use of this modeling approach and its reliability for predicting the changes in response parameters after a change in nutrient loading has been described by Rast et al. (1983). Rate of Recovery. One of the issues of particular concern in eutrophication management is the rate of recovery of a waterbody following reduction in the nutrient/phosphorus loads. Because large amounts of phosphorus are stored in lake sediments, some have incorrectly concluded that reducing the phosphorus load from the watershed would result in little improvement in water quality, especially in a waterbody with a long hydraulic residence time. However, Sonzogni et al. (1976) demonstrated that the rate of response in eutrophication-related water quality to reduction in phosphorus loading is governed by the phosphorus residence time in the waterbody. The P residence time in years is the total mass of phosphorus in the waterbody water column divided by the annual load. This is typically much shorter than the hydraulic residence time. Conclusions and Recommendations Excessive fertilization – eutrophication – is a major cause of water quality impairment. Domestic wastewaters, urban stormwater runoff and agricultural runoff/discharges are significant sources of nutrients that contribute to excessive fertilization of some waterbodies. Site-specific investigations are needed to determine the contribution of algal available nutrients from these sources and the extent to which they can be controlled. Using the Vollenweider-OECD eutrophication modeling approach, the expected improvement in beneficial uses that could be achieved in many lakes or reservoirs by effecting a given load reduction, and the expected recovery time can be estimated. Lee, G. F., Jones, R. A. and Rast, W., “Availability of Phosphorus to Phytoplankton and its Implication for Phosphorus Management Strategies,” In: Phosphorus Management Strategies for Lakes, Ann Arbor Press, Ann Arbor, MI, pp 259-308 (1980). http://www.members.aol.com/duklee2307/Avail-P.pdf Logan, T., “Nonpoint Sources of Pollutants to the Great Lakes: 20 Years Post PLUARG,” In: Nonpoint Sources of Pollution to the Great Lakes Basin, Great Lakes Science Advisory Board, International Joint Commission Workshop Proceedings, February (2000). OECD, “Eutrophication of Waters, Monitoring, Assessment, and Control,” Organization for Economic Cooperation and Development, Paris (1982). Rast, W. and Lee, G. F., “Summary Analysis of the North American (US Portion) OECD Eutrophication Project: Nutrient Loading-Lake Response Relationships and Trophic State Indices,” EPA 600/3-78-008, US Environmental Protection Agency, Corvallis, OR (1978). 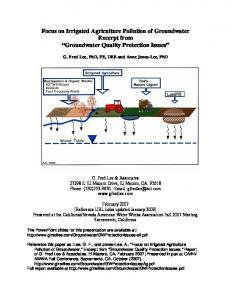 Rast, W. and Lee, G. F., “Nutrient Loading Estimates for Lakes,” J. Env. Eng. 109:502-517 (1983). Rast, W., Jones, R. A. and Lee, G. F., “Predictive Capability of US OECD Phosphorus LoadingEutrophication Response Models,” Journ. Water Pollut. Control Fed. 55:990-1003 (1983). http://www.gfredlee.com/pexfert2.htm Richards, F. A., “Anoxic Basins and Fjords,” In: Riley and Skirrow (eds), Chemical Oceanography, Academic Press, New York, NY (1965). Sharpley, A. N. (ed), Agricultural and Phosphorus Management - The Chesapeake Bay, CRC Press, Boca Raton, FL (2000). Sonzogni, W. C., Uttormark, P. C. and Lee, G. F., "A Phosphorus Residence Time Model: Theory and Application," Water Res. 10:429-435 (1976). Sprague, L. A., Langland, M. J., Yochum, S. E., Edwards, R. E., Blomquist, J. D., Phillips, S. W., Shenk, G. W. and Preston, S. D., “Factors Affecting Nutrient Trends in Major Rivers of the Chesapeake Bay Watershed,” US GS Water-Resources Investigations Report 00-4218, US Geological Survey, Richmond, VA (2000). US EPA, “National Strategy for the Development of Regional Nutrient Criteria,” EPA 822-R-98-002 US Environmental Protection Agency, Office of Water, Washington, DC (1998). 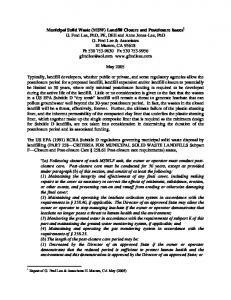 US EPA, “Protocol for Developing Nutrient TMDLs,” EPA 841-B-99-007 US Environmental Protection Agency, Office of Water, Washington, DC (1999). US EPA, “National Water Quality Inventory,” EPA 841-R-00-001, US Environmental Protection Agency, Office of Water, Washington, DC (2000a). US EPA, “National Management Measures to Control Nonpoint Source Pollution from Agriculture,” US Environmental Protection Agency, Office of Water, Nonpoint Source Control Branch, Washington, D.C., DRAFT, August 31 (2000b). Vollenweider, R. A., “Advances in Defining Critical Loading Levels for Phosphorus in Lake Eutrophication,” Mem. Ist. Ital. Idrobiol. 33:53-83 (1976). Many of the author’s papers and reports cited above are available from www.gfredlee.com. 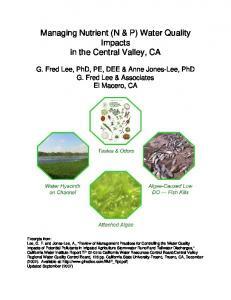 Report "Eutrophication - G. Fred Lee & Associates"